As this section has started to fill out, I've split the original page into two because it was starting to take too long to load. This section covers the towns from A to L, click here for the M to Z page. Click on the index name ( e.g. Almadena ) to show location and details on the map. A small, but expanding, village that has three restaurants and several bars. There is also a small market for farmers' produce, a butcher and three small supermarkets as of 2006. O Celeiro Situated close to Lagos, in the village of Almâdena on the (N125) Sagres road. Well known. Traditional Portuguese food. Retiro do Marujo A typical Portuguese bar. Piri Piri a speciality. Fresh whole hake with potatoes, onions, tomatoes and garlic. Local grown salads. Lunchtime snacks. Large screen TV, pool and darts. Quite some distance away from the crowds and the bustle of the tourist centres along the coastline of Algarve, the town lies near the Alentejo (at about 15 kilometres, 10 miles) and has a natural border with Spain formed by the river Guadiana, 40 km north of where the river enters the sea at Vila Real de Santo António. A winding road that runs alongside the river offers great views of the countryside, with its orchards and orange groves, and the rural way of life in Alcoutim remains very much unchanged. At both Alcoutim and the adjacent Spanish village of San Lucar de Guadiana there are castle ruins from the days of heavy duty border control. All that separates the two communities now is the river. O Soeiro Where: 4 Município. Situated in the north west of the Algarve, tourists can explore the amazing beaches of the Algarve's west coast. Facing the Atlantic, they are often wild and deserted in contrast to the warmer ones of the south. Aljezur is small and tranquil, if a bit 'tatty' looking. It is overlooked by a Moorish castle from the 10th century, which gives the best overall view of the valley and the two sides of the town. A host of free museums offer an insight into the town’s history. Aljezur is divided into two parts and lies in a fertile valley with a patchwork of fields where various crops are cultivated. It 'closes down' for the season pretty promptly in September and you'll be hard pressed to find much of a choice for eating / drinking. Taking the coast road via Vila do Bispo rather than the N111 main road from Lagos, to Aljezur it will give you the more picturesque route. Just south of Aljezur a turnoff leads to the beaches at Arrifana and Monte Clérigo. Just north, there is a turnoff signposted praia to Amoreira beach. Restaurante O Sítio do Rio Charcoal grills, Traditional Algarvian dishes; Vegetarian food. Where: Praia Bordeira - Carrapateira. Tel: (+351) 282 973 119. Where: Rua 25 de Abril. 8670-088. Tel: (+351) 282 998 534. A Bica Restaurante / Pizzeria. Pizzas; Noodles; Turkey Steak with Mushrooms. Where: Cruz- Igreja Nova, 8670-999. Tel: (+351) 282 998 440. Primavera Pepper Steak; Barbecue Ribs; Noodles with Monkfish; Fresh Fish; Pastries made of Sweet Potato, and Typical Sweets of the Algarve. Where: Rua 25 de Abril, 67. 8670-088. Where: Largo 1º de Maio, 2 . Igreja Nova ,8670. Tel: (+351) 282 991 164. Where: Rua Francisco Gomes of Avelar, 5. greja Nova . 8670. CAFÉ DO MERCADO "Bifana" (Pork Meat with Bread) a lá House. Where: Largo do Mercado . 8670-054. Tel: (+351) 282 991 223. PINTAINHO Where: Rua 25 de Abril . 8670-088. The chapel and the area that surrounds it, which includes an art gallery housed in carefully restored old buildings, retain much of the character and charm of the Algarve of centuries past. Chapel of São Lourenço dos Matos (St. Lawrence of the Woods) - The occurrence of a miracle in 1722 when the locals were searching for water prompted the construction of the chapel. The architecture is baroque, with an elegant cupola and tiled panels set over the main entrance and to the rear of the main chapel. The tiles on the walls, ceiling vaults and cupola were made in Lisbon in 1730 and recount the life of Sao Lourenço (St. Lawrence). Together they form one of the most outstanding decorative ensembles in Portugal and earn the chapel a unique place in art history. Particularly worthy of note is the harmonious way the tiles fit in with the carved and gilded vestal on the main altar and the decorative detail on the triumphal arch and at the base of the cupola. There is a good collection of 17th and 18th century statues in the church, the sacristy - which also houses a fine chest with carved decoration - and the annex. Nearby, in Sao João da Venda, the old church retains a number of Manueline features (16th century) in its denticulate exterior and the vaulting over the main altar, as well as a vestal with paintings from the end of the same century. FUZIOS Italian. Choice of pastas, seafood, steaks and home made desserts. Seasonal specials. Vegetarian selection. Starters such as Jose’s large prawns piri-piri. Desserts such as chocolate brownies with vanilla ice cream & fudge sauce. Fine wines, friendly service & superb food, bring this special unique restaurant together. Two outside terraces for al fresco dining. Children catered for. This restaurant comes highly recommended. Open: Dinner from 6.30 pm. Closed Wednesdays. Where: Situated south west of Almancil 200 meters past the Avia petrol station on the right just before the turning for Vale do Lobo. Tel: (+351) 289 399 019 or 964 413 176. BRASSERIE de BRUXELLES Manuel & Belgian chef Alain serve exceptional meals at very reasonable prices. Very comfortable, unpretentious restaurant. Outstanding meals, many prepared with delicious sauces: scallops marinated Normandy style (starter), monkfish with small leeks, Dover sole rolls with salmon tarragon sauce, lamb tenderloin with raspberry & mint, beef tenderloin with 3 pepper sauce etc. Special mussels with white wine sauce. Sat. & Sun. Brunch €9.90: 4 salads, 3 main courses, 4 desserts - Eat as much as you like. Families welcome. Recommend to book for dinner & brunch. Where: 1.5 km from main Almancil traffic lights, Immediately past the railway line on left. Tel: Mané (+351) 289 393 301. TROPICAL RESTAURANTE Beach restaurant. Antonio buys everything fresh daily from Quarteira fish market. Specialities: huge pots of steaming seafood, cataplanas, fish stews, monkfish & seafood rice, fresh fish, sardines, clams, ribs, veal, tournedos etc. Open all day, lunch, dinner, snacks & drinks. Reasonable prices for the quality. Where: Turn off main road at large Ria Park Hotel sign, go 11/2k, at ‘V’ bear left, under arch ‘Vale de Garrão’, continue straight 2k then follow signs to Praia de Ancão. Go to the last parking lot, it is the last restaurant on Praia Ançao. Look for TROPICAL written on side of restaurant & the 2 ‘OLA’ flags. Open: 10am to late all winter. Bookings Tel: Antonio / Maria: (+351) 289 398 289 or (+351) 964 066 689. FLOR DO ALGARVE Restaurante Bar. Don’t miss this! Good value for generous portions. Lovely décor, linen tablecloths, comfortable seating. Lunch: €7.50: starter, main course, coffee & drink with several choices. Set evening 3 course menus from €12.50. Selections include lamb shanks, BBQ ribs, sea bass in port sauce, chicken mascarpone, fillet steak, mussels, etc. The Sunday Roast until 15.30 all inc. €12.50. Children's menu. Large terrace. Á lá carte menu. Live entertainment on Saturdays. FANTASIA PIZZA PASTA. Full Italian menu, over a dozen pizzas & pastas + daily dish & vegetarian dish. Specialities: lamb chops, steaks, duck, grilled prawns etc. Excellent desserts. They have won several prizes for their cuisine. comfortable inside & sunny terrace. Friendly staff. Reasonable prices. In Buganvilia Plaza. Takeaway. Tel: (+351) 289 394 080. Almancil. NEWSAGENTS PAPELARIA TABACARIA. Ana Paula has a small shop with everything! All local & English, Dutch & German newspapers & Magazines etc. Stamps. CIGARETTES by the carton. Large orders accepted. Tel: (+351) 289 396 870. Non Dispensing Chemist SITIO DA SAÚDE. A non dispensing chemist. Aspirins, toothpaste, razors, soap, sun block, reading glasses, vitamins, herbal products, skin cosmetics, baby food etc. Dra. Catarina Maia Passos. Where: Quinta shopping, Loja 8. Tel: (+351) 289 392 109. DENTAL CLINIC Resident highly qualified. English staff for all your dental hygiene & specialist treatments. Emergencies, crown & bridge, root canal treatment & cleaning. Modern ultrasonic instruments. Open: Monday - Friday 09.00 to 17.00. Where: At back of Bougainvillea Plaza. Tel Mob: (+351) 912 143 547. Allegedly one of the prettiest and most typical villages in the Algarve, with brightly adorned white washed houses where two are never alike. The nearby village of Fonte Grande is an ideal place to picnic with its springs and waterfalls. Two restaurants, a grocery store and four or five shops line the main street which leads up to the church in the center of town. Early 18th-century blue-and-white tiles and a lovely gilt altar. Further up the hill are two natural fountains feature in a park and recreation area. Local folk dances at an outdoor restaurant draw take place in the summer. The old ceramic chimneys and carved wooden doors are particularly attractive. The area around the church is a delightful snapshot of the real Algarve. Main church - Built in the 13th century by the wife of the second lord of Alte to give thanks for his safe return from the eighth crusade to the Holy Land, the church has been modified on a number of occasions since, above all in the 16th and 18th centuries. The interior consists of three naves, with short, squat columns dressed with brick to bear the weight of the structure. The main chapel has a Manueline triumphal arch that is partially hidden by wooden mouldings. The vaulted ceiling is painted with decorated keystones. The walls and vaults are decorated with 18th century tiles. The chapel of São Sebastião (St. Sebastian) contains some notable polychrome tiles made in Seville which date from the end of the 16th century. The carved vestibules in the chapels of Nossa Senhora do Rosdrio (Our Lady of the Rosary) and São Francisco (St. Francis) are good examples of 18th century art; the latter is also decorated with the coat of arms of the Counts of Alte. Among the statues in the church and the sacristy; three in particular merit a mention: a 17th century Santa Teresa (St. Theresa), a Nossa Senhora do Rosario (Our Lady of the Rosary) and a Santa Margarida Lady BIargareti full of movement and life, from the 18th century. The two fonts are in the Manueline style (16th century). Chapel of Sao Luis (St. Louis) - Built at the beginning of the 15th century, it was subsequently altered until it attained its current appearance, that of a country, church in the taste of the 18th century. The interior is plain: its most curious feature is a series of four paintings in a popular idiom depicting the life of St. Louis (18th century). Fonte Pequena and Fonte Grande - For centuries these two sources were a meeting place for the women of the village who would fill their water pitchers and do their washing. Tables and stone benches have now been installed, in the shade of the trees; making this an ideal spot for having a picnic or just lazing around. Ribeira de Alte and its mills - The waters of the Fonte Pequena and Fonte Grande, which are the source of the Alte river, once turned the wheels of the village's nine mills. Most have since fallen into ruins, the Moinho da Aboboda mill, which is known to date back to 13th century, is still in evidence. Once an ancient coastal village now a very popular holiday location. The enclosed narrow cobbled streets have kept development in the village to a minimum. Many of these streets now have bars with live music and different types of restaurants but leading off from these there are still parts of the older fishing village. There are a number of holiday resorts In the area and as a result the tourists will flood the town in the mid / peak seasons. The village is located on a hill facing a natural lagoon opening onto the sea. There is a modern fish market on the seafront and a good wide promenade lined with fish restaurants ( open grilled sardines! ). There is a long open sandy beach with a choice of 'beach bars' which were once strategically spaced along its length, but are now replaced with a group of three larger bar restaurants at the town end of the beach. Also there are a number of small coves tucked under the cliffs. The 16th Century Parish Church has, in its main doorway, a prime example of the great craftsmanship of the "Manueline" era of architecture. It is the only building that has survived the earthquake of November 1755. Alans Bar Small & Long. Good snacks. Telly only. 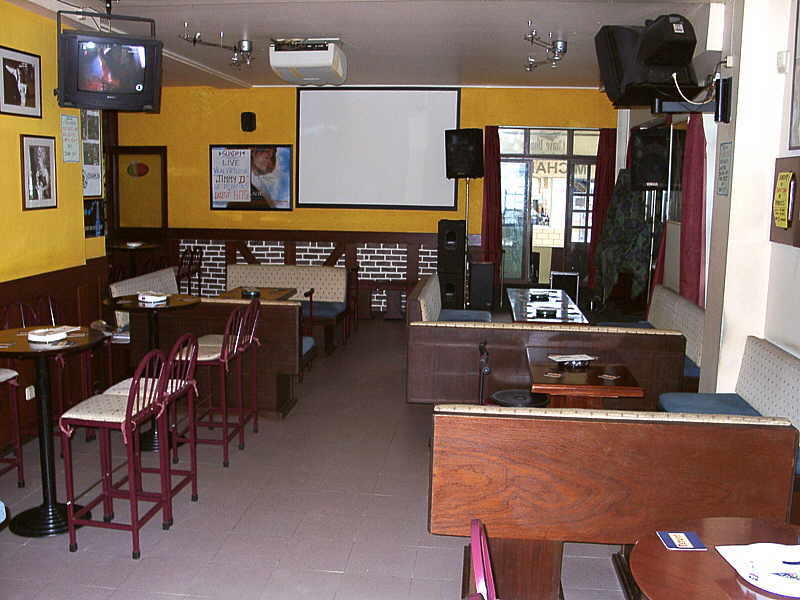 Barola Strange shaped bar, but 'back' room has excellent ● live music most every night. Where: 17-r/c Dr Fred° R Mendes. Jimmy, Miquel & Nelson's newly acquired (02/2006) bar on the hill leading toward the seafront. Live Music most nights. Karaoke from midnight onward. Small but perfectly formed! Closes eventually ( I made 07.30 ) Great atmosphere, good company. San Miquel rather than Superbok served here. 04/2006 . Where: 34-r/c Dr Fred° R Mendes. Alvor. Marias Very small bar, good for 'toasties' etc. Really a day bar with a few seats out front. Nice staff. Music Channel on the telly. Smallish but usually very busy. Shows ● big screen football but evenings is definitely ● karaoke. We inevitably end up here at the end of the day (as its near to our villa). Our 'local' when we visit. Excellent staff and boss. Sagres beer. 2003 - 2007 Still going strong. Alvor Tavern Formerly McNamaras. A new 06/2005 bar. Small, some live music. A bit out of the way. Early days yet. 10/2005 Renamed Alvor Tavern (dropped the Irish theme) otherwise nothing has changed. When it was the Shamrock it was a large scruffy unexciting bar (unless there is a karaoke night or the occasional band) but ● big screen football if you're desperate / mob handed. Attached is a pretty good Indian restaurant / take away. 04/2005 Closed. Being re-furbished. 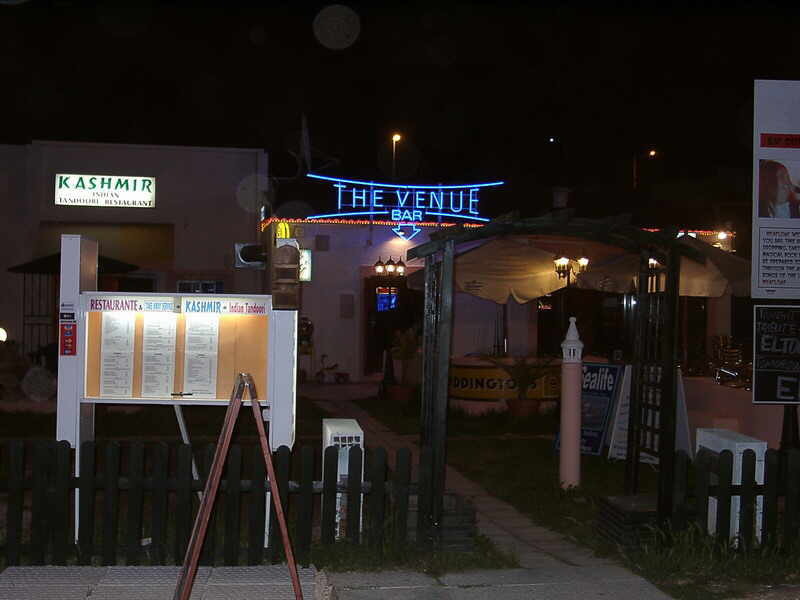 10/2005 Now re-opened as the Venue and looking very nice, ● advertising live music most nights. 04/2006 Very nice, a great improvement. Good Elvis impersonator. San Miquel. Bolan Bar Where: 2 Poeta João Deus. Calypso Bar Where: Lt 15 Qt Amoreira. Colibri Snack-Bar Where: 14-A Estr Alvor-4 Estradas. Happy Nights Where: 8 Dr Fred° R Mendes. A fairly basic, roomy bar, with Karaoke. Can get exceptionally lively in the early hours. Irish Inn See Above. A typically Irish bar, busy with music. Michaels See Above. Karaoke Bar. Alvor. O Pátio Where: 7 r/cPaz. Sei Lá Bar Where: Lt3-lj4 Qt Praia-Alvor. Venue See Above. Karaoke,. Live Shows / Music. Wild Rover Where: 2 Paz. Capacho - Where: Ed Vale-Mar-lj B Poeta Ant° Aleixo. Definitely one to visit. food, ambience, staff are all consistently excellent. A genuine Portuguese restaurant. Quite busy at weekends, but still manages to cater for 16 of us! Have used this at least twice a visit for the last five years. Located on the Alto Club villa complex (where we stay) opposite the Reception. Smart and a bit pricey. Flambé style a speciality. Mainly use this as a *breakfast bar, it opens early. Outside seating. Comfy, quiet and a good 'fry up'. Superbock. One of my favourites, just been refurbished . Good all rounder, food and service. They can handle large groups. Nice patio out front and new additional seating space upstairs 04/2004 . Still good food/service 04/2006 .A bit of a casual attitude this year, shame. 04/2007 . If you must. Food varied each visit. Bit 'gooey' (MSG overload). Vagabondo - Where: 20 Dr Fred° R Mendes. Can vary, though generally good food. The place feels 'cold', needs to be busy. A Cubata Where: 45 Dr Fred° R Mendes. A Fóia Where: Lt2-r/c-Rossio S. Pedro. A Lota Marisqueira Where: 79 Ribeira. A Ribeira Where: 15 Ribeira. Adega D'Alvor Where: 50 Mg Pombal. Al Dente Pizzaria Excellent Pizza Restaurant. Where: Lt4-lj 1 Qt Praia. Bottom end of town, down the hill. Aquário Where: 1 Dr Ant° J Almª. Atlântida Where: Praia 3 Irmãos. Barrica-Hotelaria e Turismo Lda Where: Lt-ij A-Rossio Grande. Blue Reef Where: LtC-r/c D.João II. Buganvilla Hospedaria Where: Lt 6 Pte Mendes. Casa Maré Where: 10 LgRibeira. Casa Da Familia Self-service / Take-away. Casa do Rio Where: 25-A S. João. Chefe João Where: 37 Mq Pombal. China Garden Where: 43 Dr Af Costa. Cinco Quinas Where: Praia Alvor. Dong Zhou Lda Chinês Where: Viv Marlindo-r/c D. Joao II. Com Pipas Where: 55-r/c Mq Pombal. Eurobisul-Comerção e Restauracao Lda Where: 2-A Dr Fred° R Mendes. Galeria Where: 2-C Poeta Joao Deus. Grande Muralha Chinês Where: Viv Marlindo-r/c D. Joao II. Hong Kong Chinês Where: 34-r/c Dr. Af Cost. Hong Zhou Chinês Where: 10 Dr Ant° J Almª. Luis Where: Praia 3 Irmãos. Lusitânia See Above. 65-r/c Dr. Fred° R Mendes. Marcos See Above. LtD-r/c-lj C-Rossio Grande. New Delhi Where: 66-A Mq Pombal. Nova China Where: 47 Mq Pombal. O Arco Da Velha Where: 6-A Pedro A Cabral. O Candeeiro Where: Praia 3 Irmaos. O Castelo Where: 15 Trás Cast. O Chico Where: Lt32-r/c Urbaniz Mar Serra-Má Partilha. O Parque Where: Pq Campismo. O Trovador Where: 48 Dr. Fred R Mendes. A smallish Irish bar but still manages to do live music. Friendly though a bit claustrophobic. Paladar Pizzaria Where: 5 Vasco Gama. Restinga Where: Lt 66B° Figueiral Velho-Mexilhoeira Grande, Praia . Rio Mar Where: 27, 1 D. Sancho I.
Salva Vidas Where: Vasco Gama. Santo Antonio Where: Lt2 Urbaniz St. Ant° Alvor-Montes. A village with picturesque streets, an antique fountain and tank for washing clothes. Nearby stand abandoned windmills and a typical lime kiln. Main Church - A country church (18th century). Carved and gilded altars. Interesting effigy of Nossa Senhora do Rosário (Our Lady of the Rosary) (17th century). Religious artefacts (16th/18th centuries). Hermitage of São António (St. Anthony) - 18th century edifice Panoramic views from the church churchyard. Hermitage of São Lourenço (St. Lawrence) - Built in the 16th and 17th centuries. The front of the altar is decorated with tiles from the 18th century. 10 minutes drive west of Luz, fifteen minutes from Lagos. An old fishing village, overlooking a small bay and sandy beach, with a good beach bar. Relatively unspoilt by tourism as it is protected by a conservation order to retain the areas character, (but see update below). It has some good restaurants and bars. Built on a hillside, the old fishermen's houses line cobbled streets leading to the bay, and the still active fishing fleet. (2005) Despite the so called national park / conservation order some extensive villa / apartment development is under way which probably means another village will succumb to the ever growing tourist trade. Access from the N125 is by a pretty narrow 'main' road, be careful. (The Hut) Looks basic but the food is good, particularly for fresh, grilled fish. 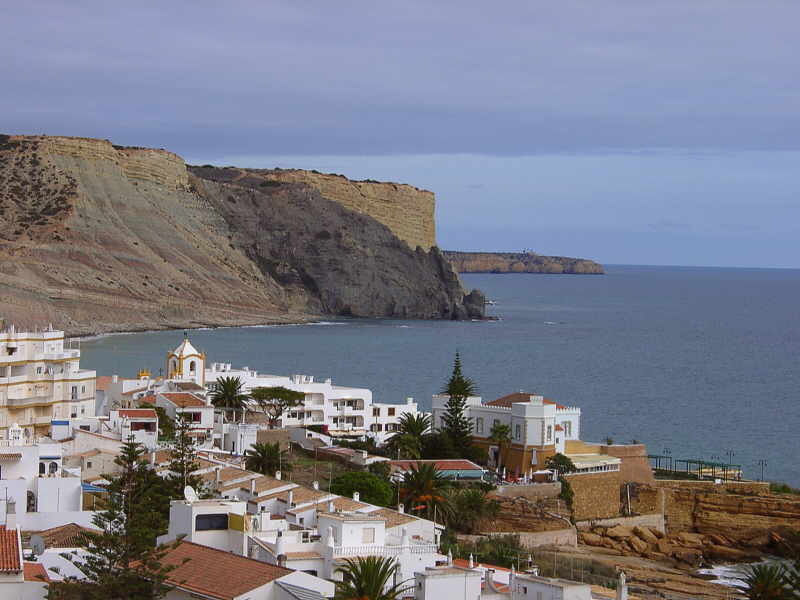 And it offers a lovely view high over Burgau beach and across to the cliffs. AncoraS Family run restaurant. Terrace with sea view. International menu with specialties such as Sole with Bananas, Steak Tartare and Pepper steak. A bit on the pricey side but popular never the less. Reservation recommended. Open:12:00-15:00 Friday to Sunday, 19:00-23:00 Tuesday to Sunday. Where: Rua da Praia, Burgau. Beach Bar A popular beach bar at Burgau. Well known for its good food (Fish Grills) and service. Sunbeds and canoes for hire. Snack bar Open: 7 days 09.30-18.00. Caravela International and Portuguese cuisine. cataplana, many fresh fish etc. all with veg. Good house wine. Terrace overlooking countryside. Open: 6:30 to 22:30. Evenings only till May. Where: 1 km from Burgau toward Sagres / Salema on the right hand side. Book José: Tel: (+351) 282 697 461 or Mobile: (+351) 936 457 859. A Friendly Portuguese restaurant. Eat inside or out, also a summer terrace. Omelettes, Fish, Duck, Pork, Steak and some good cataplana (for two or more). Where About half way between Praia da Luz and Burgau on the local road which runs nearest to the coast. It is on the right hand side of the road coming from Luz, before the right turn to Almadena and almost opposite Porto Dona Maria. The Pig's Head Pub grub and Sunday roasts - Pool Tables. Seasonal live music. Karaoke. Big TV for sports. Smugglers Bar Details next visit. Sardine Factory Souvenirs, T-Shirts, Gift ideas: Ceramics, Jewellery etc. Fishing tackle (with hire service) . UK cigarettes. Where: On the one way street up from beach & Smugglers Bar. Tel mobile: (+351) 917 761 089. A village on the main EN 125, with roads that lead south to Praia da Luz, and north to Barão de São João. A typical Portuguese village. The part facing the main road looks fairly modern and the roads are well made but go one row of houses back and the roads revert to old cobble style and are murderously narrow in parts. If you go into the village, rather than just by-passing it on the main road, you will find a few restaurants and bars, a supermarket and newsagents. Adega do Papagaio Choose from various menus and cook yourself on a hot stone at your table. Good salads and wine. Offers a fixed price (13 Euros) 'eat as much as you like' menu option plus Fado shows Tuesdays and Saturdays during the summer season. 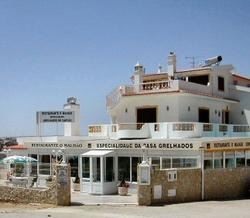 An 'Up market Pool Cafe', with panoramic views to Sagres, just 1 Km from Luz. Running for 12+ years. Good food. Lunches, Dinners and Snacks all day. Provides a Take Away service and can cater for Private Parties. Open: 7 days a week from 10am. O Fontenario Friendly family run restaurant. Cool and spacious with a patio for dining outside. Extensive Wine list. Attentive staff. Great food at reasonable prices. O Areoes Just outside the village of Espiche this restaurant offers traditional Portuguese food and specialises in the Portuguese "Fado" singing and dancing. Camping Turiscampo Espiche A useful camping site. The beach (Luz) is about 2,5 km away. The site has a restaurant, bar, snack bar and minimarket. Where: On the right near the cross roads by the second turning for Luz (coming from Lagos). Camping Orbitur-Valverde The beach (Luz) is about 3 km away. The site has a restaurant, bar, pool, playground, tennis and a minimarket. Mobile home service station, Tents, Caravans and Bungalows for rent. Faro is the principal town of the Algarve. Also home to its international airport. It is often overlooked as visitors just pass it on their way to the resorts, but if you get a chance to stop for a while you will find it a fascinating and quite a picturesque town. Though it is quite a large sprawling town, it is probably best if you park up near the centre or by the marina and walk. There is quite a mixture of 'old fashioned' and modern shops as well as masses of cafe bars and restaurants. The main point of interest is the peaceful old town, reached via the Arco da Vila, an 18th century arch built on the site of a medieval castle gate with stork nests at the top. At its heart is the Largo da Sé, a cobbled square surrounded by elegant buildings, including the Bishops' Palace. Two hundred of its valuable books, now in the Bodleian Library in Oxford, were stolen during the period of Spanish rule in 1596 when English troops burned the city. In the center of the square is the Renaissance-style cathedral, which was all but destroyed in the English attack. The base of the bell tower, its medieval doorway, and two chapels survived, but everything else was rebuilt in the following century. The interior is decorated with 17th- and 18th-century tiles and behind it is a 16th-century convent converted into an Archaeological Museum that includes remains from the nearby Roman ruins of Estoi. Particularly interesting is the mosaic devoted to Neptune and the four winds. Nearby is also the Church of São Francisco with a plain façade but with rich gilt-covered woodwork and blue and white tiles in the interior. Back in the modern center of town is Faro's most bizarre sight, the Chapel of Bones in the baroque Carmo Church. The walls are entirely covered with bones and skulls from the church cemetery, while the rest of the interior is Baroque, mostly decorated in precious Brazilian gold leaf. The Church of São Pedro is also attractive, with a fine altar whose central image is a gilded Last Supper in relief. Many of the neighbouring streets are now pedestrian only, and are filled with many cafes and restaurants. A famous café is Café Aliança, a charming old-style coffeehouse with images of a 'old' Faro. By the harbour are two small museums, the Regional Ethnographic Museum, providing a glimpse of traditional Algarve way of life, and the Maritime Museum, with model ships illustrating the region's and the country's naval history. The closest beach is a massive stretch of white sand on the Ilha de Faro, reached by frequent ferry or bus services, or if you are driving take the turning off of the first roundabout at the airport ( the one with the statues of people watching the planes taking off ). Dois Irmaos Restaurant Restaurant situated in an old small corner house. Where: In the square opposite the Cathedral. Largo Terreiro do Bispo 20, Faro. Pousada de Sao Bras Portuguese cuisine. Overlooking the sea and Caldeirao mountain. Good international wine cellar. Credit cards accepted. Where:At Poco dos Ferreiros, Sao Bras de Alportel, Faro. Tel: (+351) 289 845 171. This inland town, not to be confused with Lagos, about 12 miles to the west, is the wine capital of the Algarve. It is not known when Lagoa was actually founded, and it was only after 1773, when it was elevated to the status of a town, that its history was first documented, but it is known that nearby Estombar and Porches were important centres in the Islamic and medieval periods and that Ferragudo had defensive ramparts. Nowadays Lagoa is at the forefront of the modern Algarve. Standing on a small hill, it is surrounded by vineyards and its white houses gleam in the distance. A very peaceful town in contrast to the tourist centres on the coast. Nearby Carvoeiro, with its charming sandy cove, is an old fishing village which became a popular holiday resort, but of the ancient fortress and convent there is little left. A walk through Lagoa's ancient streets will soon confirm this with the heady aroma of ageing wine drifting from the underground cellars. The local wine is served in all the bars and restaurants and a winery tour is available. Casa Velha do Pescador Between Carvoeiro and Armacao de Pera. 100 meters to the beach. A 19th century fisherman's cottage carefully restored and filled with antiquities. Benagil. Tel: (+351) 282 358 840. Tel Mobile: (+351) 917 844 823. Fax: (+351) 917 844 823. Chrissie's Belgium restaurant with creative cuisine. Tel: (+351) 282 341 062. Julio's Portuguese and international cuisine. Fresh fish and meat from the BBQ. Tel: (+351) 282 358 368. Mitch's International cuisine. Wednesday night Indonesian menu. An old Portuguese townhouse atmosphere. Tel: (+351) 282 356 379. O Lotus Traditional Portuguese and Algarvian cooking. Tel: +351) 282 352 098. PHARMACY MACETA - Lagoa. New premises (2006). Very good chemist in Lagoa with all pharmaceuticals as well as brand names, cosmetics, skin & sun care products. Many perfumes. Helpful, multilingual staff. Pharmacist always on duty. Where: Apotheke 24 - Std. - Dienst. Clarks, Gabor, Adidas. Ladies’ & men’s styles available at factory outlet prices. Up to 40% discount. Plus Nike Golf Shoes at discounted prices. The Algarve’s largest selection of Men’s, ladies’, children’s, Sport & casual footwear. Where: On EN125, 200mt east of Lagoa , Mestre Maco building. Tel: (+351) 282 343 065. Just ten minutes from Praia da Luz is one of the Algarve's largest towns. Lagos is a major fishing port yet steeped in history and interest. Lagos was the capital of the Algarve from 1578 until 1756. It is, I think, still the Algarve's third or forth largest town. It was the home of the first slave market which can still be seen standing on the riverbank. The statue of Henry the Navigator overlooks the promenade displaying the towns close association with the sea. Plenty of lively bars and good shops. The old town defined by the city walls and two streets (Rua de São Gonçalo and Rua 5 de Outubro) is particularly nice with plenty of street cafes and restaurants and is a great place to roam around. Grab a 'freemap' (available in most bars, shops etc.) to get the best out of this town. There are several very large supermarkets mostly situated in and on the outskirts of the town. Coming from Luz the Intermarche is probably the most accessible ( see the section below ). Amuras Bar Where: 3 Marina. Aplauso Bar Where: 1/3 Lg Quarteís. Arco Iris Bar Where: 9 Escola-Espiche. Artist O Bar Where: 56 Ant C Sant. Arquinhos Snack Bar Where: 7 Lg Merc- Espiche Luz. Atlântico Restaurante Bar Where: Estr Meia Praia. Baía Bar Restaurante Where: 67 Rua Pts Port. 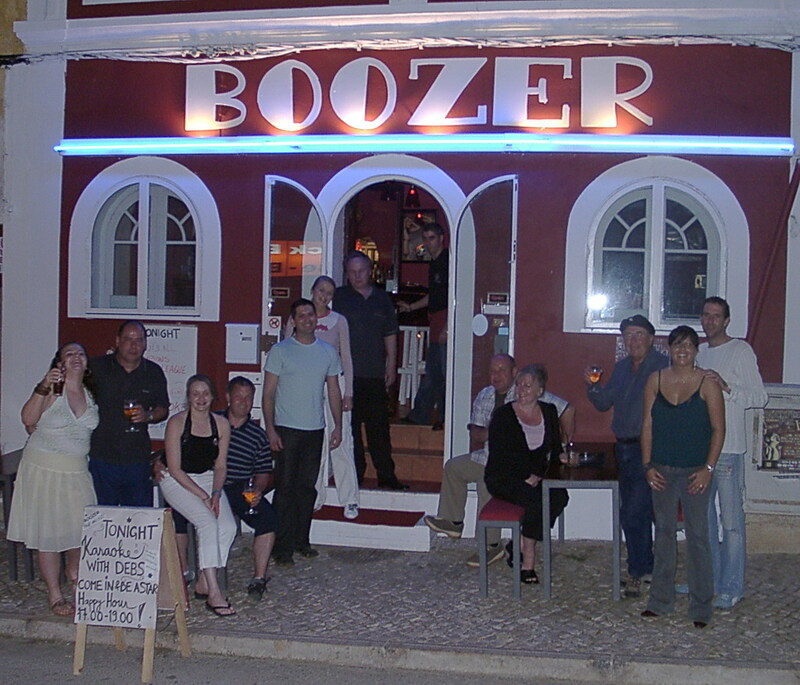 Boozy Soozey's Where: C Com Luztour-Lg 7-Praia Luz. Bombordo Bar Where: 75 - 25 Abril. - Praia da Luz. Chaplins Bar Where: Lt4 Av Pescadores - Praia Luz. Christophorus Bar Where: Vale Peles - Bensafrim. Da Marina Wine Bar Where: 35 Av Descobrimentos. Do Papagaio Wine Bar Where: 11 Lg Adega-Espiche. Kopus Bar Where: Ed Luztur-B-rc - lj AX-Praia Luz. Lionheart Bar Where: 12 Cast Governadores. Lota Bar Where: Doca pesca. Luís Bar Where: 50-r/c Ant° C Sant. Luisol Bar Where: 21 S José. Milenium Restaurante Bar Where: 76 - 25 Abril. Mirante Bar Where: Praia D Ana-St. Maria. Moinho Bar Where: Urbaniz Hospital SJ Deus. O Cangalho Bar Where: Br° S. João. O Caseiro Restaurante Where: Estr Arão - Arão. O Castelo Lda Where: 47 - 25 Abril. O Celeiro Bar Restaurante Where: Estr Nac 125-Almádena. Pastas Lda Where: Ed Mar-A-Vista Praia Luz. Plum-Bar Restaurante Lda Where: 17 Ant° B Viana. Shaker Bar Where: 68-r/c 25 Abril. Six Bar Where: 20 Lg Poço-Almádera. Sol Nascente Bar Where: Ponta Pied-St Maria. Stevie Ray´s Bar Jazz Bar Where: 9,1o Stª Graça. Taco Snack Bar Where: 58 Estr Nac 120-Bensafrim. Vai A Remos Wine Bar Where: Vale Amoreira-St Maria. Velha Wine Bar Where: 7 Tv Tanoeiros. Zawaia Bar Where: 99-25 Abril. A Floresta Where: 51 Ant° C Sant. A Lagosteira Where: 20 - 1° Maio. A Matilde Where: 142 Estr Nac 125-Odiáxere. A Muralha Where: 29 Estr Porto Mós. A Vaca Where: Rua Silva Lopes,. Aida Where: Lt2 -lj 4 Av Cabo Bojador. Antonio Where: Praia de Porto de Mós. As Asinhas Where: Lt24-lj A Estr Ponta Pied. Asia Chinês Where: C Com Marina-lj-32/3. Atlântico Bar Where: Estr Meia Praia. Atlântis Where: Lt4-r/c-D Lg Salazar Moscoso. Baía Bar Where: 67 Rua Pts Port. Bom Apetite Where: Lt 12-B José Af. Bon (N) Itália Pizzaria Where: Lt25-lj B Estr Ponta Pied. Branca Azul Where: Lt1 Urbaniz Branca Azul-Montinhos Luz. Cachoa Where: Qt Cachoa-4 Estradas. Cacto Where: Est. Nac, 125 - Odiáxere. Campimar Where: Praia P Mós-St. Maria. Cantinho Do Mar Where: 6 Soeiro Costa. Caravela Snack-Bar Where: 14-r/c 25 Abril. Caramba Where: 4 Cap Franc° S Rijo-Br° S.Joao. Cardápio Where: 79 - 25 Abril. Cascata Where: 62 Marreiros Neto. Cataplana Where: 25 Abril-Praia Luz. Chaminé Where: 23 Estr Nac 120-Portelas. Dom Giovanni Where: 83 - 25 Abtil. Dom Henrique Where: 75 - 25 Abril. Don Sebastião Regional food and International dishes. Wine cellar. Credit cards accepted. Where: Rua 25 de Abril 20, 8600 Lagos. Dos Artistas Where: 66 Cand Reis. Dynasty Where: 21, 1° - 25 Abril. Escondidinho Where: 2-! Beco Cemitério. Filho d'Mãe Where: lt7-cv-lj C-Moinhos-St Maria. Florestal Where: Mata Nac-Br° S. João. Gaivota Branca Where: Maia Praia- S.Sebastião. Gilberto Where: 85 Rua Pts Port. Jotta 13 Where: 58 - 25 Abril. Kalunga Where: 26, 1° D Mq Pombal. Kohinoor Indian Where: 18/20 Silva Lop. Mandarim Where: Casa Madeda-r/c-Meia Praia-S. Sebastão. Maq'jeite Where: 49 Cons° Joaq Mach. Mediterrâneo Restaurant Where: Rua Senhora de Graca, 2. Mendes Where: 73 Estr Nac. 120-Portelas. Milenium Bar Where: 76 - 25 Abril. Mira Mar Where: 5 Barroca. Momo 59 Tibet Where: Travesso Do Mar 3. Mullens Where: 86 Când° Reis. Navegador A choice of a sea view terrace, on street or inside dining. Popped in for lunch and ended up with a splended sea food grill. Where: Rua da Barroca. 1-3 Lagos. Just up the steps from the Infante car park (on the seafront) leading into the old town. No Patio International food. English roasts. Booking advisable. Open: Tuesdays to Saturday 18:30-22:00, Sunday lunches 13:00-16:30. Where: 46 Rua Lancarote de Freitas, Lagos. O Alberto Where: 27 Lg Convento St Glór. O Algarvio Where: 71-A-r/c D. Vasco Gama. O Cacto International food. Meat dishes. Regional specialities. Credit card accepted. Where: Outside Lagos on the EN125 - Odiáxere. O Camilo Where: Praia Camilo-St. Maria. O Caseiro Where: Estr Arão - Arão. O Celeiro Bar Where: Estr Nac 125-Almádena. O Charco Where: 3- 25 Abril. O Degrau Restaurant Where: 46Rua Soeiro da Costa,. O Galeão Where: Rua Da Laranjeira, 1. O Paraíso Where: Lt 12-s-cv-D Urbaniz Villa P D Ana. O Pescador Where: 6-10 Gil Eanes. O Pinóquio Where: 5-A-r/c-D Gil Eanes. O Poço Where: Av Pescadores-Praia Luz. O Tacho Where: 21 Estr Nac 120-Bensafrim. O Terraço Where: 12-r/c Lancarote Freit. O Triângula Where: Lt Gav-lj 1 Gago Cout. O Trovador Where: 29 Lg Convento Srª Glór. Os Almeidas Where: Vale Coito-Odiáxere. Os Arcos Where: 32 -25 Abril . Palácio da China Where: Lt 28-A Estr Porto Mós. Papacorda Where: Lt3-lj B Urbaniz Villa P D. Ana. Patinhas Where: 10/2 Prof Luís Azev. Piri-Piri Lda Where: 15 Lima Leitáo. Plum-Bar Lda Where: 17 Ant° B Viana. Pôr Do Sol Where: Meia Praia-S. Sebastiao. Prato Cheio Where: Lt23-A Dr. Franc° S Cam°. Pouso Do Infante Where: 11 Af Almª. Reis Where: 21 Ant° B Viana. Rodrigues Cervejaria Where: 4-cv-D Flamónica 1° Maio. Roque S Where: Urbaniz S. Roq-Meia Praia. Sereia Where: Ed Luztur-U-2- Zona A - Praia Luz. Sheng Hua Where: 14 Lg Pts Port. Solamigo Retaurante Where: Lt5-r/c Av Descobrimentos. Taj mahal Where: 56 Int Sagres. Terraço da China Chinês Where: 91, 1° -F 25 Abril. The Taste of Índia Where: 27 Af Almª. Vista Alegre French restaurant. Dinner only. Reservations necessary. Where: Rua da Ilha Terceira 19B, Lagos. Volare Where: 61 - 25 Abril-Praia Luz. Simplylagos.com A nice source of Lagos Information. BBC.co.uk A nice article on Lagos and its history. 24hr Pharmacies Weekdays 09.00 - 13.00 and 15.00 - 19.00. Rota system applies for luchtimes, weekends, night time and public holidays. Lacobrigense- Where: Rua Prof. Joaquim, Alberto Taquelim, Lote 8 Dto, Lagos. Tel: (+351) 282 762 901. Neves Where: Rua Porta Pequena, 3-5 Lagos. Ribeiro Lopes Where: Rua Garrett, 22 Lagos. Silva Where: Rua 25 de Abril, 9 Lagos. Tel: (+351) 282 762 859. Telo Where: Rua Henrique Correia Silva, 1-3, Lagos. Supermarkets Plenty of large Supermarkets in Lagos. Certainly worth using for the initial 'big shop' at the start of your self catering / villa holiday as considerable savings can be made compared with 'local' prices. Intermarché Situated on the Luz side of Lagos. Mentioned here as it is the largest supermarket nearby. Straight across the first roundabout as you enter Lagos (from Luz), on the right side of the road at the bottom of the long slope. Tel: (+351) 282 782 233. Lidl Where: Left turn at the first roundabout as you enter Lagos (from Luz), down the hill, cross the next roundabout. Lidl is on the left side of the road. Modelo Part of a popular Portuguese chain. Where: Left turn at the first roundabout on entering Lagos (from Luz), down the hill, left turn at the next roundabout, going up the hill. Follow the road for about two or three minutes. The Supermarket is on the right, the entrance is just before the petrol station. Mercado de Peixes A fresh Fish, Meat, Fruit and Vegetable Market. There are many different vendors. It is spread over two floors with a further 3rd floor which is a coffee bar and restaurant. Get there early for the best choice for fish. Where: On the main road facing the Town Waterfront boardwalk, between the Post Office and the Marina. Pingo Doce Part of a Portuguese chain. They do flower deliveries. Where: On the other side of Lagos (from Luz). Follow the signs for the N125 to Portimao. Crossing the bridge by the marina and continue on the N125 for five minutes, past the petrol station (on the right). The Supermarket is on the right, keep an eye out for the sign. Lisbon is the capital of Portugal, lies on 20 low hills. The principal attraction of the city lies in the magnificent views from its many belvederes, shady tree lined avenues and flower filled balconies. Lisbon also has a generous share of historical monuments, churches and museums. An ideal location for shopping, markets and restaurants, a visit to Lisbon should not be missed. The 1755 Lisbon earthquake took place on November 1, 1755, at 9:20 in the morning. It was one of the most destructive and deadly earthquakes in history, killing between 60,000 and 100,000 people. The quake was followed by a tsunami and fire, resulting in the near total destruction of Lisbon. Located between the foothills of the Serra de Caldeirao and the Atlantic Ocean coastline of Southern Portugal Loule is rich in architecture and is famous for its market. Also a center for local handicrafts. Loule is an active market town with some remains of a castle dating back to the 12th Century. This place is a rural administrative and active market town with some remains of a castle dating back to the 12th Century. The Arab castle has been virtually destroyed leaving some walls still standing that are now surrounded by modern buildings. Like most other towns in the Algarve, most of the older potentially interesting buildings have been destroyed in the earthquake that occurred in 1755. Within the remaining walls is a museum with an explanation of what was in the past the grandeur of the castle. The various earthquakes that it has suffered through its history have damaged the 13th Century Church of São Clemente. However, its Gothic arches and side chapels are remaining from the 16th Century have survived. Savour the atmosphere of a traditional Algarvean village of white houses and modest gardens. Main church - With its origins in the 16th century. This church has undergone subsequent alterations. The facade has a simply decorated Manueline doorway (16th century), and the side entrance is from the same period. The main and side chapels have carved and gilded vestals (18th century). Among the statues to be seen, a 16th century Virgin and Child and a 17th century Nossa Senhora da Assuncão deserve particular mention. In the square in front of the church stands an interesting cross mounted on a limestone boulder. Fonte Benemola Classified Site - There are nature trails for walkers. Within the park are a number of caves containing archaeological remains. The local fauna includes otters, a wide variety of birds and a few colonies of bats.On the approach road is the Cerro dos Negros viewpoint, which looks out over a broad sweep of coastline. The white houses of the village are scattered higgledy-piggledy on the hillside around the ruins of the castle. Its narrow, streets are an alluring mix of bright flowerpots, whitewashed walls and peace and quiet. Main church - Although of little architectural interest, this church does contain one small treasure: an illuminated papal bull on parchment dated 1550. It also boasts carved and gilded 18th century vestals and statues from the 17th and 18th centuries. Castle - The fact that it does not have an "alcaçova" (house of the castle commander) suggests that the castle was built in the 12th/13th centuries to defend the peasants who worked in the fields from Christian attack. Captured by the Knights of the Order of Santiago (St. James) after the fall of Tavira, it was here that the Master of the Order, Paio Peres Correia, awaited the arrival of the army of King Afonso III before going on to seize Faro (1249-1250). Its ramparts are built of "taipa" and are one of only a few surviving examples of Moorish fortifications in Portugal. Archaeological excavations have uncovered a Moorish residential area and confirm that part of Salir is built on the site of the old fortification. The castle is an excellent vantage point. To the north it looks out over the forbidding ranges of the Serra, while seaward the view, is of more gentle, verdant hills. Rocha da Pena Classified Site - A limestone rnassif with steeply scarped sides,. Rocha da Pena rises to a height of 479 m (1600 feet). There is a panoramic view from its summit which takes in the sea. A beautiful church, built in 1944 in the Algarvean rustic style, looks out from the top of a hill. The churchyard is one of the most marvellous viewpoints in the Algarve and from it can be seen an endless vista of hills covered with cork oaks, stretching away almost as far as Loulé, Salir and Alte. In the nearby ranges of hills are to be found picturesque thatched stone houses, round in shape, that are used as barns these days but which recall the dwellings of the peoples who lived in the region in prehistoric times. Just west of Lagos. Originally an old fisherman's village. Protected by Rocha Negra (black rock) cliff to the east and an old fort to the west. This large sandy beach is overlooked by the bars and restaurants of the village itself. A lovely esplanade runs from the church along to the beach bars full of craft stalls and 'tourist traps'. There are some Roman ruins recently excavated and preserved, look for the small entrance in the wall of the esplanade (by the O'Poco restaurant). There are good water sports facilities - snorkelling, windsurfing and sailing school, paddleboats and some boat trips. It is a safe beach ideal for children, with lifeguards on duty during the summer months. Also there is excellent fishing to be had from the extensive rock formations to the west of the beach. There a basically four main roads Rua 1 de Maio running north to south from the E.N.125 Sagres / Lagos road to the church, which is effectively the town centre. The Rua de 25 Abril running East from the church and the Rua Direita running west from the church (the main street). The Av. dos Pescadores runs past the church for a short distance and leads onto the 'newish' promenade running from just below the church, along the sea front to the main beach area. Mostly Luz A separate set of pages for Luz Bars and Restaurants. A Concha Where: 6-r/c-Praia Luz. Cavaleiro da Luz Where: Lt10-lj 3 Av Pescadores-Praia Luz. Duke of Holland Where: 19 Rua Praia-Praia Luz. Fortaleza Where: 3 Igrª - Praia Luz. Godots Where: 51-r/c 25 Abril-Praia Luz. Lime Tree Where: Rua 25 de Abril, no. 16, Praia da Luz. Luz-Tavern Where: 2-A Pç Repub-Praia Luz. Malhão Where: Urbaniz Montinhas Luz-Praia Luz. Marujo Where: Lt3-r/cD Av Pescadores-Praia Luz. Mirage Where: Lt1 Ramalhete-Praia Luz.